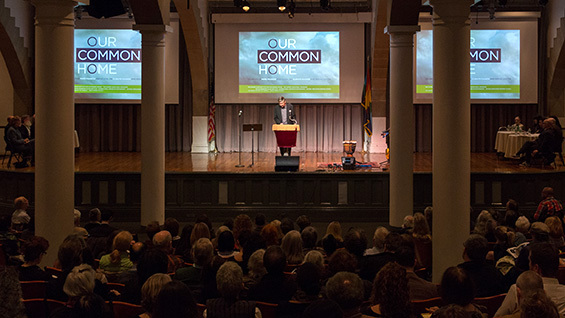 Poets, Musicians, Scientists, Architects and Educators Celebrate "Our Common Home"
On Thursday, March 24, poets, musicians, scientists, architects and educators gathered in The Great Hall for “Our Common Home,” a response to Pope Francis’ encyclical, Laudato Si, that argued for mankind's moral responsibility to care for the planet. Hailed by environmentalists, the encyclical added a spiritual dimension to the climate crisis alarm. Hosted by The Cooper Union Institute for Sustainable Design (CUISD) and co-sponsored by Urban Green Council, Natural Resources Defense Council, International Center of Photography, The Poetry Society of America, Continuing Education and Public Programs of The Cooper Union, the free, public event welcomed an audience of over 500 guests and cultivated a positive atmosphere of engaging dialogue, profound photography and creative performance. Acting President Bill Mea (left) opened the evening with remarks. He admitted that as a Catholic, it was significant for him to hold this event at The Cooper Union, particularly during Holy Week. 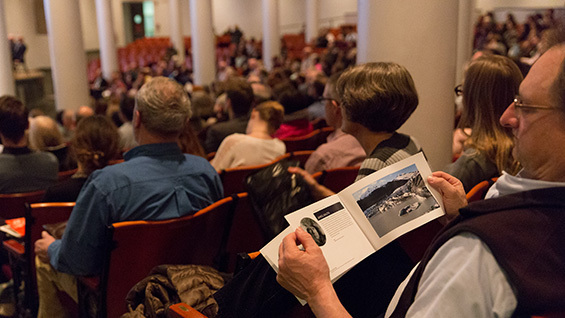 Kevin Bone, director of the CUISD and professor at The Irwin S. Chanin School of Architecture, provided a brief history of the Institute, noting that it organized its inaugural lecture seven years earlier and has hosted over 40 events at Cooper since. Professor Bone then gave an overview of the encyclical, noting that the remarkable alignment of a religious leader and science has created a need for multidisciplinary discussion. The event highlighted relevant poetry alongside talks on sustainable design, religion and science, with photographic interludes of our changing planet. Marie Ponsot (right) delivered the Catholic canticles and Andrew Sullivan read religious and secular poetry. 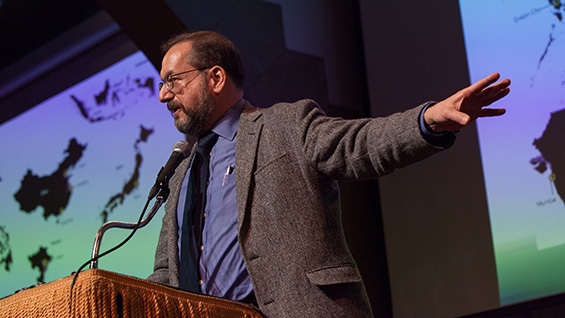 While the individual readings and talks took the audience on a journey between disparate topics and expertise, their central message united the evening. The encyclical is not just about climate change, but also about its intersection with social justice. The works of esteemed photographers rolled throughout the event in silent interludes to observe the important ways in which visual art investigates and influences our perceptions of the world. The black and white photography of Sebastião Salgado illustrated iconic ice formations complete with dramatic cloud formations and penguins. James Blog’s Extreme Ice Survey images depicted the rapid melting of these glaciers by showcasing the same glaciers at 8 year intervals. Other photography included J Henry Fair’s captures of the environmental impacts of human resource extraction, visually doubling as abstract beauty. The works of Robert Glenn Ketchum, Cameron Davidson, Paul Nicklen, Cristina Mittermeier, Paul Colangelo, Greta Rybus and Brown W. Canon III shed light on the beauty of earth’s dynamic and pristine landscapes, societies and wildlife. David Turnbull, professor at the school of architecture, discussed his approach to sustainable design in teaching and practice. “Young designers need to be experts at three things,” Turnbull said. “They must be rainmakers – able to do things from the outside; spiders – able to build webs and networks, and flies – experts at nonlinearity.” This type of thinking helped Turnbull envision his organization, PITCHAfrica, which provides access to clean water for communities. PITCHAfrica has trademarked a Waterbank design for schools, campuses and districts in Africa to harvest rainwater. The first school was built in 2012 in Kenya and can harvest 350,000 liters a year of water. The school is 6,000 square feet and cost 38,000 euros to build, which is approximately $80 a square foot. After Prof. Turnbull came farmer, poet and speaker Scott Chaskey (left), fresh from planting peas in Amagansett. He read the St. Francis Blessing and a poem of his own, Cerulean. Mr. Chaskey recently attended a community farming conference in China. “A true ecological approach is a social approach,” he said. Mr. Chaskey is a proponent for small farmers like himself as they grow 70% of the world’s food. 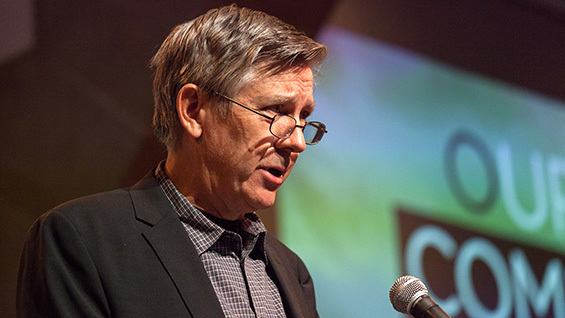 David W. Orr, author and educator at Oberlin College, discussed the politics of the climate change issue. 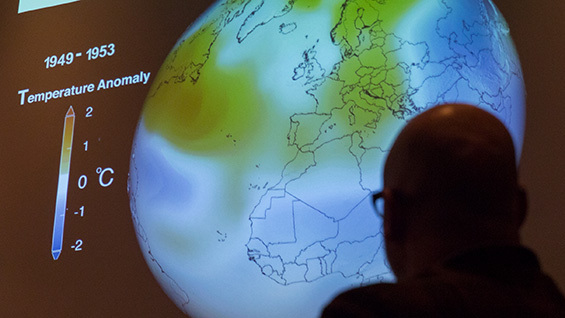 While economics is at the heart of environmental policy, he urged the audience to think of it in moral terms. He stressed the word “integral,” which he views as radical, but explains and highlights the fact that the planet is linked to all that is, all that was, and all that will be. Following Lerner-Lam came an example of the climate refugee crisis. Kathy Jetnil-Kijiner is a native of the Marshall Islands, an island country in the Pacific Ocean between Hawaii and the Philippines. At less than six feet above sea level, the country has already been a victim to destruction from flooding and grows evermore vulnerable. In September of 2014, Jetnil-Kijiner was invited to speak at the United Nations Climate Summit Opening Ceremony. The "Our Common Home" organizers screened a video of her poetry performance titled “Dear Matafele Peinem” dedicated to her daughter and the next generation who will be impacted by climate change. 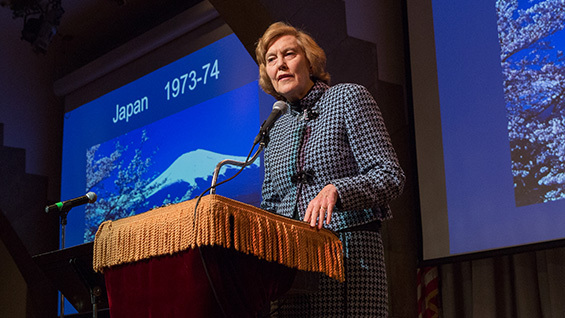 Mary Evelyn Tucker, co-director of the Forum on Religion and Ecology at Yale and a professor in the master’s program between the School of Forestry & Environmental Studies and the Divinity School, also talked about the global impact she has witnessed through her travels. The message of the night – the need for moral and ethical change – rang through her stories of indigenous cultures and rituals that rely on the earth being threatened. 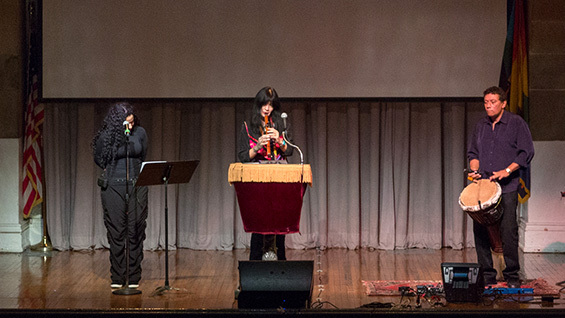 In the penultimate presentation, Joy Harjo, along with Jennifer Elizabeth Kreisberg (right) and Alex Alexander, performed an original piece comprised of spoken word, traditional vocalism, flute and electric percussion, drawn from their cultural heritages of Myskoke Nation, Ulali, First Nation and Columbia, respectively.